It's another slim issue this time; newsletter stories have to take a back seat to the prints of course, and the recent prints have been even more labour-intensive than usual (and that's really saying something!) But even with the endless scramble to keep the prints coming your way, I've still found time to keep the studio construction moving along, and as you will see from the photo report in this issue, quite a lot has been accomplished since I last spoke to you. Thanks for your interest in this printmaker's work! I'd better be careful here ... it would be all to easy to let this story just become some kind of travel diary - because we sure covered a lot of miles during the three months we were in Japan! After leaving her parents' place we made a loop through Shikoku, then went back over to the mainland, down as far as Himeji, and then started hopping from here to there on the way back up toward Tokyo. On the day we were in Okayama the weather turned bad, something quite unusual during that trip, and we took shelter inside a department store for a couple of hours. Why would I consider that worthwhile telling you? Because I saw something in there that really gave an impetus to my progress toward becoming a printmaker. I guess it must have been on the temporary exhibit floors upstairs that we ran into a display of woodblock prints set up by a travelling salesman from a Tokyo publisher. Of course most of them were the usual ukiyo-e reproductions: Utamaro, Hiroshige, etc., but at one side of the display were four prints of a very different kind, and these stopped me dead in my tracks. They were modern prints, but made the old way - with separate designer, carver and printer working together under the organization of a publisher. 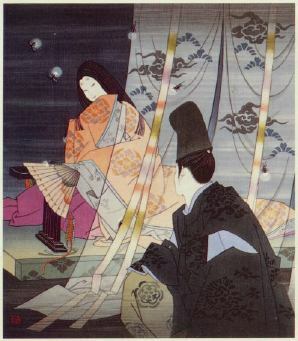 They depicted scenes from the Genji Monogatari, and were designed by Okada Yoshio. The publisher had obviously pulled out all the stops in their production; the prints were gorgeous, with a very large number of impressions being used. I had had absolutely no idea that such beautiful prints were still being produced, and I had to have them. We weren't carrying enough money for the purchase, so we arranged with the salesman that we would visit their company when we returned to Tokyo. And what a visit that was! Although I was probably just another 'bothersome' visitor from the point of view of the publisher - Mr. Saeki of the Yuyudo Company - from my side the visit was a wonderful eye-opener and stimulus. He was very open and friendly to us, and I think not just because we were buying a set of his new prints. He chatted with us about the state of the printmaking business in Japan, gave me information on where I could pick up the supplies I intended to take back to Canada, and even provided me with some blank woodblocks from his own stock. What he actually thought about my plan of becoming a woodblock printmaker I cannot say, but outwardly anyway, he was supportive. Another important stop was at the workshop of the Shimano family, the last surviving block planers in Tokyo. I wasn't sure that they would be willing to take an order from me, as I had the impression that they wouldn't want their carefully seasoned and prepared cherry wood to be 'wasted' on a beginner like me, but such fears were unfounded, and they too were friendly and cooperative. I ordered and paid for some beautiful smooth blocks to be shipped back over to my home in Canada. It was then nearly time to wrap things up and think about returning to Canada ourselves; I knew that the computer system I had installed at the music store would need some attention by now, and of course I still had no job, and would need to find some way to make a living. But before getting ready to head to Narita, there was yet one more important thing to do; I still had not had a chance to meet any carvers or printers. 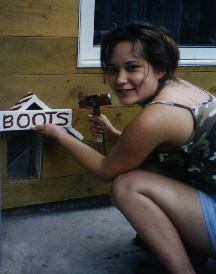 Come to Japan for three months and not see any craftsmen at work? Crazy! I had asked Shimano-san about this, and he had suggested that I try contacting yet another one of the reproduction publishers - one who had a 'stable' of carvers and printers working on the premises. 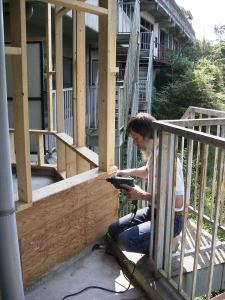 Of course I'm doing this with Canadian-style 2x4 construction, although in this case, because I need strong insulation, I'm using the thicker 2x6 (giving me about 15cm of insulation). Putting the wall up was fun, although it was a bit more complicated than most walls, because of the odd angles that the parts meet. Well, that certainly made the decision easy - I would have to import a set of windows from North America myself. I got home, got on the internet, and started firing off inquiries to various companies who had products that looked like they would fill the bill. A small company in rural Ontario Canada - Thermotech Windows - had a very interesting product line; the windows were neither aluminum (which conducts heat to the outside very rapidly) nor vinyl (very weak on windows this large), but were made of fiberglass reinforced plastic. They were triple-glazed, gas filled, and were coated with a substance that eliminates heat loss out through the glass at night. They could make sizes that would suit my needs, and the openable windows came ready-fitted with screens. 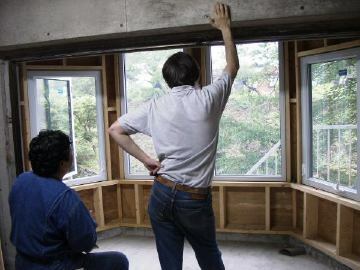 So for a total of just under 300,000 yen, a fraction of the price of the 'best' Japanese product, I have a set of wonderfully strong, fabulously well-insulated, top-of-the line windows. And they really are very well made: they are solid and strong, and the three layers of glass are bonded into a single sealed unit. The openable casements have a very tight seal, and there is no chance of any drafts once the strong latch has pulled the window closed (with a most satisfying 'thunk' sound!). 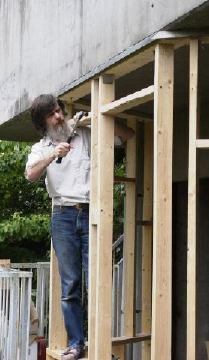 A few years from now, when it's time to get to work on the house upstairs, it's going to be fun shopping around among the North American 'package' home builders to see what they can make for me! Strolling in Ome near David's home one day in May, we saw young wild wisteria plants everywhere in the hills. They must have germinated from seeds that had fallen from older plants high up in the trees. Their tendrils curled this way and that, entwining each other and swaying in the gentle breeze. It looked just as though all these wisteria 'children' were playing with each other. Looking from a viewpoint at the mountainside or at the forest on the steep river bank we could see many gorgeous lilac clusters scattered among the tree tops. It is true that cultivated wisteria is beautiful - hanging neatly from trellises - but the view of wild ones on green trees is also very attractive. That day while enjoying the wild wisteria, we came across a strange scene: a wisteria growing in a tall cone shape! How could it grow that way? As we approached, we found the answer - brown dead branches among the dense green wisteria, a skeleton wrapped up and choked by the beautiful flowering plant. Such a shocking contrast of life and death! Well, this is a photo taken in Dave's kitchen. Yes, that's a wisteria in the window. The roots are far down below - more than 10 meters down along the river bank on the neighbouring property. Last year this vine twined its way along the fence bordering the properties, but it didn't appear so healthy, and didn't bloom in the spring. This year though, come late April, it grew rapidly and covered the entire fence with gorgeous lilac clusters. As in most cases, flowers like this are best seen from the neighbour's point of view, so David was very pleased with the beautiful sight he saw from his window. 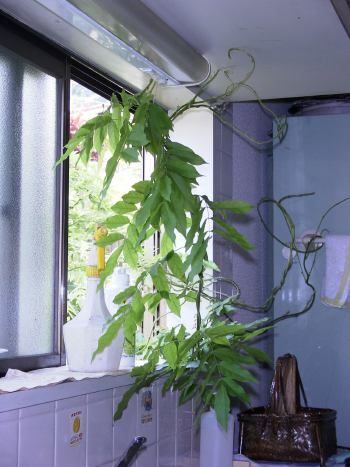 When the flowering period was over, the plant directed all its energy into extending its vines, and they began to grow ferociously. One headed straight for David's house across the two meter gap, and became ... what you see in this photo! To my surprise, it was only I who was puzzled to see this. The owner - David - just smiled happily and said "This is amazing! First just one little tendril succeeded in making its way through the window. But once it was in, other vines followed it one after the other! Isn't all this greenery beautiful, don't you think?